Native tanned and smoked moose hide dress with attached shoulder cape of navy woollen cloth. It has been decorated with glass beads, yarn and hide fringes. Sleeves were made by rolling rectangular pieces of hide into a tube and inserting the tops into the upper sides of the dress. All seams are sewn with sinew thread. 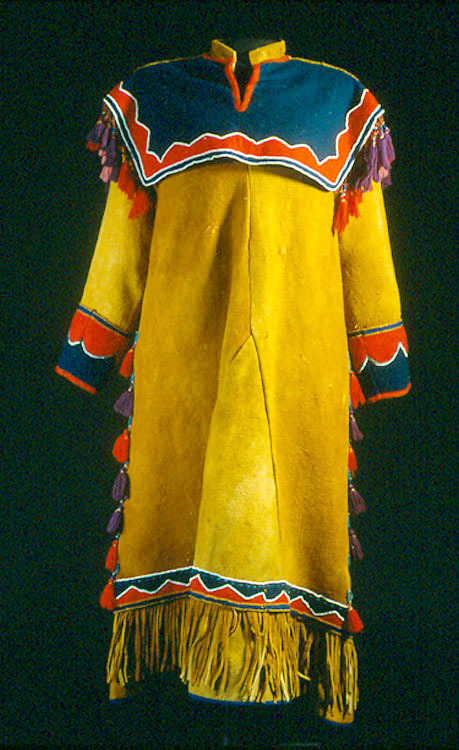 The stand-up military-type collar was influenced by European styles of clothing introduced by fur traders. Read more about sewing or preparing hides - enter 'hides' or 'sewing' in the search box to your left. This dress was made by a Dene woman using a moose hide that was prepared by smoke tanning. The light brown or amber colour of the hide was produced by placing it over a smouldering fire made from rotten spruce or willow. This process also made the hide more moisture-resistant. The dresses were knee-length and were worn with a belt. The outfit was completed with hide moccasins, a rectangular-shaped hood and a pair of leggings. Leggings are tube-shaped coverings for the lower legs, and were held in place with hide or cloth garters just below the knee. A traditional form of decoration consisted of narrow panels of flattened and dyed porcupine quills that were woven into a band using a bow loom. The finished panels were sewn to the dress. Porcupine quill-wrapped fringes and pendants made from animal or bird bones also served as decorations.